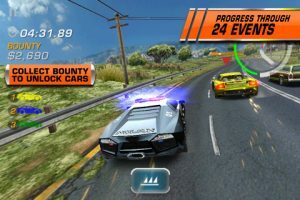 With Need for Speed: Hot Pursuit, Electronic Arts demonstrates once again that they are the masters of shrinking the home console experience down to iPhone size. Like their other recent entries (MMA, for example), Hot Pursuit manages to make wonderful use of the platform’s capabilities in creative, and sometimes remarkable ways. The result is one of the best arcade racing experiences for iOS, and one that would be right at home on the dedicated portable gaming platforms. Immediately upon loading, Hot Pursuit roars onto the screen with amazing production values, preparing players for a white-knuckled gaming experience. After a short tutorial, you’re thrown straight into the action as a police officer tasked with taking down underground racing enthusiasts. As you progress through the game, you’ll unlock different vehicles, each with varying stats. And in each level you’ll be given different tools and abilities with which to take down these deviant drivers. Set up a road block for them to crash through, or a set of road spikes to take out their tires, or even an electro-magnetic pulse that drains their vehicle’s power. Because it’s not about taking the offenders peacefully. It’s all about taking them down with extreme prejudice. But not every mission involves you playing “Smokey” to the AI’s “Bandit”. 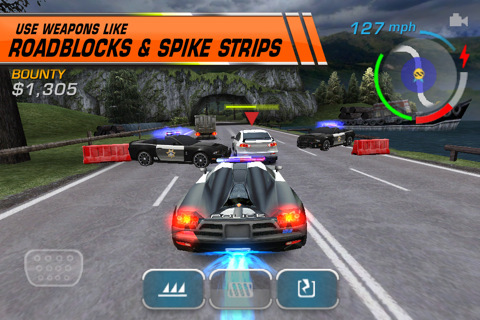 In some missions you’ll need to prove your skill against other police officers by beating them in simple races. In others you’ll be tasked with simply wreaking as much havoc as possible. Indeed, one of Hot Pursuit’s biggest strengths is the sheer variety of missions. And if you’re tired of besting the AI, the game has a local WiFi or Bluetooth multiplayer mode allowing you to take on your friends. Electronic Arts has proven themselves to not only excel at giving mobile gamers oodles of eye-candy on their iPhones, but also being adept at making what should be complex games remarkably playable on a console with no buttons. 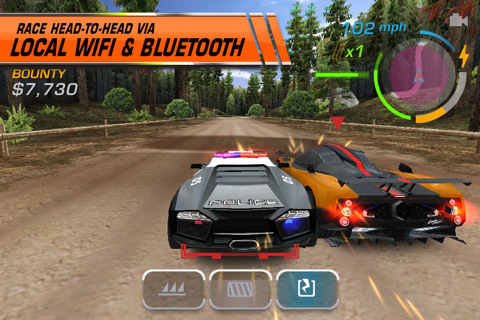 In Hot Pursuit, you’ll steer by tilting the iPhone. Acceleration is handled automatically, which only serves to make the game feel more action packed. But if you feel the need to slow things down a bit, simply place your thumb on the bottom-left corner of the screen. For a nitro boost, slide your right thumb from bottom-to-top on the right side. And, to nail a 180, slide your left thumb down on the the screen while tilting the screen, simulating an emergency brake. It’s all stunningly simple and intuitive. The sheer amount of levels, quality of presentation, and simplicity of controls make Need for Speed: Hot Pursuit a must-have, top-tier game for iOS. The difficulty does ramp up a bit quickly, but after a little bit of practice you’ll be taking down lawless lead-footed racers in no time. Bottom Line: At under five bucks, Need for Speed: Hot Pursuit is a must-have for arcade racing fans. Top notch in every way. 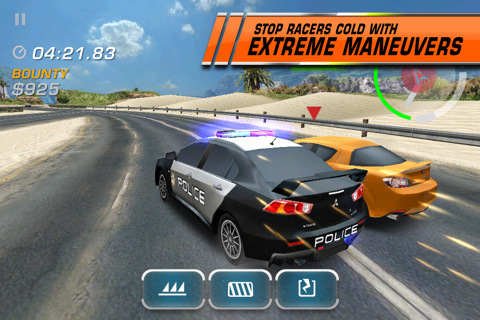 Need for Speed: Hot Pursuit is compatible with iPhone, iPod touch, and iPad. Requires iOS 3.0 or later.